great location, 1/2 block from Bourbon ST. yet quiet enough at night away from crowds, beds comfortable, most of the staff very friendly and helpful. nice small courtyard. Had a nice pool but the only draw back was it was not heated which was a disappointment. I would stay there again. WE liked the old world charm. . Our room was very small. Location was amazing! Staff was friendly and helpful. Rooms were beautiful and clean! The only "complaint" I have is that unexpected $35 per night parking fee. It was worth it however because parking down there is hard to come by! The hotel was very nice and quaint. It was a perfect location for walking everywhere we needed to be. I would definitely recommend and stay there again. It was a wonderful experience being able to walk out of the hotel right into the heart of the French Quarter! It’s something everyone should experience at lest once in their lifetime!!! very nice hotel and close to almost everything. We enjoyed very much! Hotel is located a block from Bourbon Street. Ladies at the desk were pleasant as well as the bell staff. Unfortunately, the room was subpar in cleanliness, especially the bathroom. I would pass on the restaurant located on-site...the server was not very nice, she actually never smiled or checked on our table after the food arrived. The food was ok. The bed sheets were dirty with hair and stains. Towels were also dirty and so was the actual shower. The room was dusty and the bed was not comfortable at all. Location wise it was prime, other than that, it was run down and dirty. Hotel was surprisingly quiet given that it is one block from Bourbon Street. Lots of street work going on, but I'm sure that will be over at some point. We enjoyed our stay and the hotel restaurant was very good. Only complaints, the guy behind the desk was not helpful at all when we arrived. He didn't explain or seem to care that our reservation had been cancelled due to our plane being delayed. We also had a nonfunctioning TV that was not fixed. Another guest told me they were having the same problem. Other than that though other hotel staff was very pleasant and we really enjoyed our room. 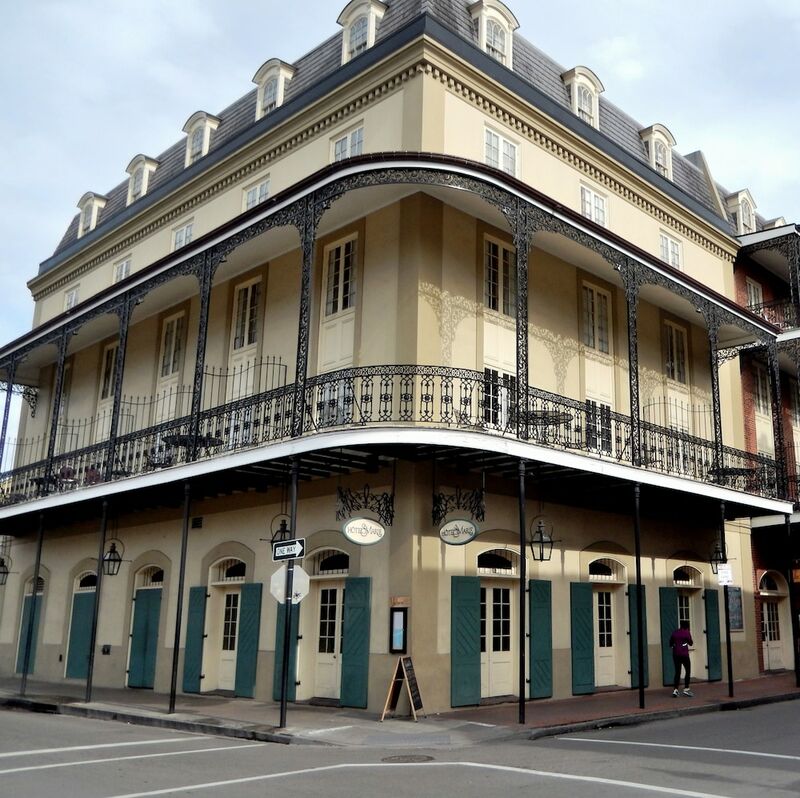 Located in French Quarter, Hotel St. Marie is adjacent to Bourbon Street and within a 10-minute walk of other popular attractions like Jackson Square. This 3.5-star hotel has 103 rooms and welcomes guests with 2 restaurants, an outdoor pool, and free in-room WiFi. Enjoy dining at Vacherie Dining Room, one of 2 onsite restaurants. Savor a meal from the comfort of your room with room service, or entertain your taste buds with a beverage at the bar/lounge or coffee shop/café. For your convenience, a cooked-to-order breakfast is served for a fee each morning from 7:00 AM to 11:00 AM. Guests can enjoy cable TV and stay connected with free WiFi. The bathroom offers hair dryers and free toiletries. Other standard amenities include a coffee maker, free newspapers, and a safe. Guests of Hotel St. Marie enjoy an outdoor pool, free WiFi in public areas, and a meeting room. Valet parking is offered for USD 34.00 per night. The 24-hour front desk has staff standing by to help with concierge services, securing valuables, and luggage storage. Additional amenities include free newspapers, a porter/bellhop, and a reception hall. We are glad you enjoyed our location! Thank you for choosing our hotel and taking the time to share your perfect rating! We hope to welcome you back to New Orleans—soon! We are so glad you enjoyed our location! Thank you for choosing our historic boutique hotel. We hope to welcome you back very soon! We are so glad you enjoyed your stay! Thank you for choosing our hotel and taking the time to share your perfect rating! We hope to welcome you back to New Orleans—soon! Thank you for taking the time to share your feedback. Our adjoining valet parking service is offered as a convenience in our dense historic area, where parking options are limited. The $34 per night fee plus tax $38.51 is typical of our area. Please know that all of your comments have been shared with management. Otherwise, we hope you had a wonderful time in New Orleans. Thank you for reaching out. We appreciate the feedback for our hotel and especially our staff. We will be sure to pass on the kind words and we can't wait to welcome you back. We are so glad you enjoyed our perfect location! Thank you for choosing our hotel and taking the time to share your perfect 5-star rating! We hope to welcome you back to New Orleans—soon! Thank you for choosing our historic hotel for your New Orleans stay. We typically receive high marks from our guests for our cleanliness, but are sorry if you feel we missed the mark during your stay. Please know your feedback has been shared with our management team. Vacherie Dining Room - Restaurant and bar serving breakfast, brunch, lunch, and dinner. Vacherie Cafe - Café serving breakfast, lunch, and dinner. Recreation features at Hotel St. Marie include an outdoor pool. The preferred airport is New Orleans, LA (MSY-Louis Armstrong New Orleans Intl. ): 28-min drive, 16.3 mi/26.3 km.